Kammermusiksaal at the Herbert-von-Karajan-Straße 11, Berlin Germany, is often named the small Philharmonie, after Germany's premium concert hall, with which it shares a foyer. 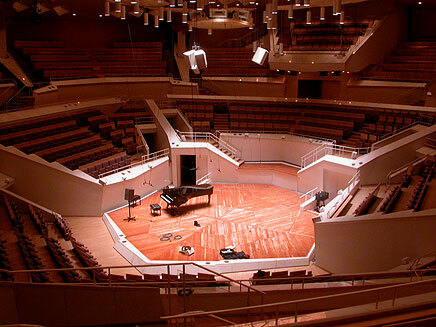 Designed by Hans Scharoun, Kammermusksaal was completed just as the Berlin Wall was about to topple in 1987. The building is designed from the inside-out, with blocks of seating accommodating the audience in a 360 degree rake around the central stage. If the central stage arrangement was an experiment in the Philharmonie, it was taken for grantedand taken furtherin the Kammermusiksaal; seats are configured to allow moving ensembles and experimental music, in which performers are placed in multiple locations. The interior features an optimum of reflective surfaces to allow for a small gap between direct and early reflections at any listening position. It causes a desirable combination of intimacy and sufficient reverb length in mid frequencies.